« Wolves pile up pitch stats!! There is turmoil on the sidelines. That much we know for sure. If not a whole lot else. Coupeville High School cheer coach Cheridan Eck hasn’t been at her post during the past two varsity football games, and multiple sources confirm she isn’t running practices. 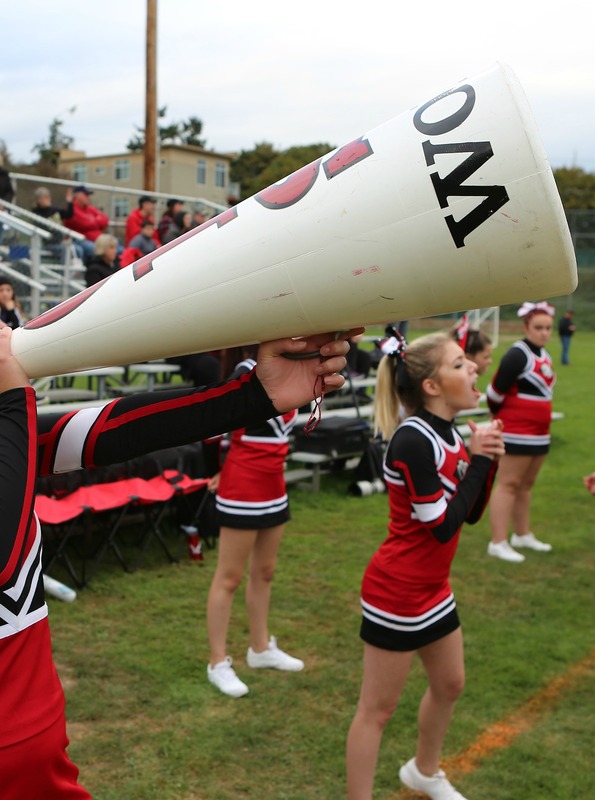 The Wolf cheer squad, after originally being scheduled to perform Saturday, when the CHS football team travels to Lake Washington High School to play Bellevue Christian, has been scratched. Coupeville Principal Duane Baumann replied “Scheduling conflict. Cheer will be at the next games.” when asked for comment. Whether that means a conflict with available transportation (soccer is also traveling to the same location) or school employees available to monitor the cheerleaders in their coach’s absence, was unclear. It is the only statement school officials have had, as they have not responded to questions about Eck’s absence or her current status. The cheer coach has declined comment, saying the school instructed her not to speak. Wolf cheerleaders are now repeating the same company line, referring any questions to Baumann or Assistant Principal Melissa Rohr, who, as I mentioned, have no comment. They don’t have to talk to us if they don’t want to, and they certainly don’t have to address persistent chatter that the reason for Eck’s absence allegedly stems from a letter written by parents detailing their differences with the coach. There are those who have said “The school will tell you when they want to,” followed by the expectation that I should go quietly sit in the corner until the adults make up their minds. If that’s your opinion, fine. It’s not something I 100% agree with, though. Coupeville High School is a public, taxpayer-funded institution. A certain transparency has to come into play at some point. Also, people gossip, non-stop, part of the boon and bane of small town life, and that’s spurred by all the advances in online nattering. Part of what I’m trying to do is weed through the rumors and innuendo. The truth will set us free and all that jazz. And, at the core of the gossip is something bigger. If a CHS coach is removed, and if it happens because of parent complaints, that has a potentially chilling effect on all our coaches. With remarkably few exceptions, the coaches I have worked with at CHS and CMS over the years have been devoted, hard-working, easy to deal with, helpful and in the job because they want to impact the next generation. Regardless of the sport, they have to deal with balancing egos, playing time, parental expectations, winning and teaching. It is not an easy job, and frankly, it is one which has become harder in recent years, as everyone has become way more sensitive to criticism. I’m not advocating for a whole-sale return to the “good old days,” back when grizzled football coaches use to bounce clipboards off of kid’s faces (or far worse), but there’s also a point where we go too far in coddling people. At the same time, every parent’s responsibility is to protect their children, and it’s certainly not my place to tell anyone how to raise their son or daughter. I can’t speak to the contents of an alleged letter I haven’t read, and I have a great deal of respect for our current CHS administrators. Their job is often difficult and hard to navigate, especially in situations like this. As we move forward in Cheergate 2016, I hope for a positive resolution, whatever that may be. I, like a lot of others, will be intently watching to see what develops. Thoughts or comments? I can be easily reached at davidsvien@hotmail.com. It’s hard for me to imagine the actual story is more damaging than the silence we’ve been left with. But, I suppose, someone’s made the calculation that it would be. So here we are, left to speculate until somebody owns up. Keep digging, David. Your work is much appreciated.